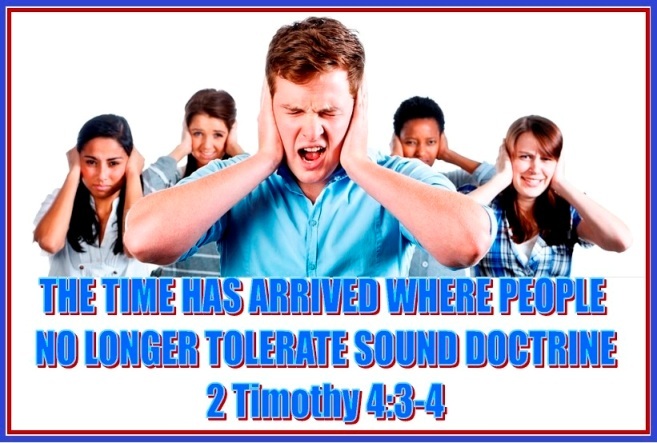 “For the time will come when they will not endure sound doctrine, but wanting to have their ears tickled, they will accumulate to themselves teachers in accordance with their own desires, and will turn away their ears from the truth, and will turn aside to myths” (2 Timothy 4:3-4). The time has arrived where people do longer tolerate sound doctrine and ‘so called ministers’ do not preach the true gospel. Their false preaching results in false churches, which Jesus Himself called “synagogue of Satan” (Revelation 2:9; 3:9). Paul spoke much about such false ministers, especially in 2 Corinthians 2:14-17; 4:1-6. The majority of today’s ministers are not called, chosen and anointed by God to preach the gospel. Rather, they are called and sent by themselves. They send their resumes out to get a job, just like any applicant would do. They preach, not the true gospel, but a false one. Paul saw such ministers in his day: “For if someone comes to you and preaches a different Jesus, a different spirit, and a different gospel, you put up with it” (2 Corinthians 11:4; Galatians 1:6-9). They came, uninvited, through the back door to contradict the gospel Paul preached (Galatians 2:4). They used the word of God for their own benefit, as Paul implies: “Unlike so many, we do not peddle the word of God for profit. On the contrary, in Christ we speak before God with sincerity, as those sent from God” (2 Corinthians 2:17). False preachers have “a form of godliness but deny its power” (2 Timothy 3:5). They are empty vessels. Their gospel has no power to save anyone from sin. Paul warns, “Have nothing to do with them.” They “oppose the truth” and are “men of depraved minds, who, as far as the faith is concerned, are rejected” (2 Timothy 3:8). God hands them over to depraved minds to think and do what they should not think and do. These self-called, self-sent false ministers are rejected by God. False ministers preach a false gospel of their own invention, usually based in psychology; refusing to believe in the true gospel, they preach an imitation gospel that sends people to hell. A true Christian’s authority is only the Scripture and nothing additional is needed, whether that “adding on” is tradition, or psychology, or claiming, “the Lord told me,” or a dream, or a vision, or a false miracle. Scripture alone is what needs to be taught and it is the true preaching of the gospel that liberates us, as Paul declares: “It is for freedom that Christ has set us free” (Galatians 5:1). Any preacher who refuses to believe in the absolute authority of Scripture (2 Timothy 3:16) is a false minister; and nullifies their teaching, because if they do not believe in the inerrancy of the Bible; what other erroneous subjects are they teaching? A false minister preaches what people want to hear, not what God wants them to know. Most television and radio preachers preach a false gospel. They do not preach regeneration, even though nothing else matters unless we are new creations. They do not preach repentance, the law of God, the holiness of God, and God’s demand for holiness. For God is holy; he is the one “who made you holy” (Leviticus 22:32). If we are not living holy lives, we are not Christians. This sounds very harsh but God himself said that He makes us holy and Jesus said that “only the one who does the will of my Father” will enter heaven (Matthew 7:21). False ministers do not preach a saving faith that leads to obedience to God. They also do not speak about judgment and hell. Instead, they preach self-sufficiency, self-esteem, psychology, emotionalism, and pure pragmatism, which says that if something makes me feel good, then it is good – what a crazy thought this is, but this is what is happening! False ministers preach only to make money. In fact, they have no other motive. They distort the gospel to make it palatable so that gullible people will give them money. They remove all truths people do not want to hear, like repentance, regeneration, holy living, hell, and judgment. They are like Judas, who was, in the end, possessed by the devil. He stole money and sold Jesus for thirty shekels of silver. They are like Simon Magus, who desired to buy the Holy Spirit and trade it for a profit (Acts 8). False ministers are charlatans, and we see them all over the world. They are filled with greed. A true pastor should not be a lover of money. Peter writes, “Be shepherds of God’s flock that is under your care, watching over them—not because you must, but because you are willing, as God wants you to be; not pursuing dishonest gain, but eager to serve” (1 Peter 5:2). Many pastors find out what the Congregation wants and does not want to hear instead of teaching about salvation and the lordship of Jesus Christ. Remember, the wolf in sheep’s clothing speaks nice words, never makes you anxious, and chooses only those topics that please the crowd. In his final warning to the church, specifically to young Pastor Timothy, Paul implies that sound doctrine may be unpleasant to hear. This is why only true pastors and courageous leaders should be chosen by churches to teach their flock. They understand these things and are willing to pay the price, while others are not. We hope that God will rise up churches that will be courageously faithful in teaching and preaching the Word of God and do not dilute doctrine and adapt to the changes occurred in the society in the last years. Society changes but God’s Word never does, it is the same today and forever. There is nothing that gives anyone permission to distort what they want to teach out of the Bible. Society should not change what the Word says; on the contrary, the Word should change society! Today there is a great apostasy in the church and many want to be politically correct in order to not offend anyone but Jesus said: “Woe to the world because of the things that cause people to stumble! Such things must come, but woe to the person through whom they come!” (Matthew 18:7). Controversy is nothing new to the church but today some of the greatest controversies are those where the leaders and people compromise the Word of God to fit an ever-changing world. May it never be so in your church. We need to pray for those who are chosen and appointed to be pastors and teachers to stand firm as Jesus did even in the midst of criticism. We need more faithful pastors that will preach, teach and stand for the truth of the Holy Scriptures. Remember, the Bible is the only tool you need. All Scripture is given by God. And all Scripture is useful for teaching and for showing people what is wrong in their lives. It is useful for correcting faults and teaching the right way to live. By using the Scriptures, those who serve God will be prepared and will have everything they need to do every good work (2 Timothy 3:16-17).